Our decks are custom built to your needs. Our repairs are tailored to your budget. Making your property look brand new again! ​​We are proud to provide Southern Ontario's best quality customer service along with 100% satisfaction. Welcome to King City Decks & Fence. We are a dedicated group who enjoy outdoor revitalization and building; we specialize in all forms of backyard improvement beginning with your valued deck, gazebo and pergola in the Markham area of York Region. Our mission is to help our customers design and build their dream deck for the best affordable price that will reflect the beauty of Markham and to create backyards that will be enjoyed for their functionality and beautiful looks for years to come. Curb appeal on outside house inspection is so important to home values and we believe the final product will deliver this. Call us if different options regarding finishes are important to you. Amazing railings and gates and gazebo designs are available which we are happy to discuss with you. Interesting alternative surface finishes that are sure to please you are available. Super competitive deck building prices is important to us along with our gazebos and pergolas that come in many styles to suit your vision. The value we bring is as good as it gets; nobody wants to overspend or compromise on quality. In order to plan and construct a great deck or gazebo, you need to know King City Decks & Fence Contractors are fully up to date on products, designs and regulations which is how we are able to provide up to date and accurate information, not to mention, beautiful decks. Decking materials range from low-cost pressure treated wood to cedar materials, and slightly higher cost materials such as various types of composite decking and IPA, even some exotic hardwoods. Decks suffer from the ravages of sun and weather elements like rain, snow and ice, so suddenly noticing that the back yard structures need immediate attention is not really a surprise. Whether a refurbishment is required or a new deck build, take advantage of our experience in working with wood, synthetic and concrete products and the building of structures such as decks, gazebos, sheds, fences and, patios. Take some time with Joe and see how creative you can be with a design that will look amazing, but won't break the bank. Decks and fences will give you all the satisfaction you need, but it's on you to provide the care and maintenance for lasting value and use. Excellent man-made composite products are also available and can help decks last longer and look better with less ongoing maintenance. If you are considering building or refurbishing your deck, please give us a call, we can provide just exactly what you need without breaking the bank. Markham is a thriving city in the Regional Municipality of York.and is located some 30 km north of Toronto. The 2016 census shows Markham's population at approximately 330,000 and growing very fast. Markham is Canada's 16th largest city (which it changed from town status to city status in 2012). Markham was first inhabited by the Iroquois about 1000 years ago with the easy access to the (later named) Rouge River, and thrived eventually becoming part of the 5 Nations of tribes in the area. Eventually hamlets were formed through immigration such as Elgin Mills by the French, German Mills by the Pennsylvania Dutch (Deutsche), Milliken, Unionville and Reesorville which is downtown Markham. Some attractions in Markham include Flato Markham Theatre, which is one of Canada's premier theatre houses serving Markham residents and all visitors making the trip to be entertained. 300 live performances take place there each year and showcases the cultural diversity of the community growing. Markham Museum houses and relates the story of the progressive settlement of Markham and takes you on a journey with the heritage buildings and gardens available for viewing. Visitors often picnic and relax while taking in the Museum. Varley Art Gallery shows off one of Canada's well respected Group of Seven Artists, Fred Varley, who made Unionville home for years. historical and contemporary exhibitions are provided at the acclaimed gallery ongoing. 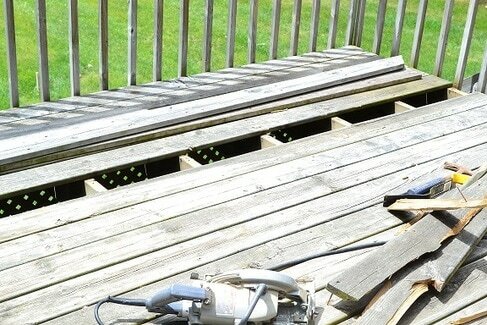 Deck design, deck building, and deck refurbishment are all included in our services that we offer in Markham. ​If you're wanting to build that new deck of your dreams, or restructure an existing one, give us a call for a free consultation where we can review by-laws, designs, and optimizing the project to the maximum value and use whether pressure treated, red cedar or composite. Customer service and relations are at the top of the list for us when we engage with a homeowner, and we never stop working hard to earn your satisfaction. When we start a project we will complete the work without interruption (except weather), until completed. Severe storms, missing materials and other unusual circumstances can cause us to be delayed, but we will do everything to finish on time. Eaves troughs, soffits and drains can drag a home down if they are not at their best. You would be very surprised how freshly cleaned eaves or new eaves and drain materials can revitalize a home. Kaycan Products pictured. Check out our eaves and gutters page. When you finally make that choice to design your backyard and create your oasis, give us a call. Sometimes small retaining walls, or gardens are forming part of your plans and we can help with those ideas that are crashing around in your head. We will sit down and help you figure out what exactly you are creating and perhaps share some ideas that you can use to realize your vision. We will show you construction details and finishes that will provide you with the lasting quality you are expecting. With so many types of finishes available now that each have their own benefits, it's good to study the broad landscape of decking. If you are looking to erect a fence for property definition and/or privacy, the choices are plenty with cedar, PT, or iron, and each with their many design options. We take the time to show you many options and finishes. One of the more difficult aspects of erecting fences is the coordination with your neighbours. Don't forget to talk with an open mind about the types of styles you are both looking for and how you can come together in making the right decision regarding look and cost. Finished wood structures are beautiful, but we all know they can lose their luster and begin to look worn and tired after a time. Fence and deck revitalization is essential to maintaining the beautiful appearance and your outdoor enjoyment, but remember it is also essential in maintaining structural integrity and longevity. Without replacement of exposed rotting wood, or proper sealing, staining and upkeep, bare wood will be exposed to the elements and will continue to deteriorate fairly quickly until surface, or even structural replacement is required. Cleaning and re-staining of decks should be done every three years or so; it will ultimately keep costs down in the long run. If necessary, damaged or rotting boards can be replaced and deck railings should be checked and secure. Wood fences take a beating over the course of a year with winter snow and blizzards, summer storms, and endless winds. Fences can be maintained for a long time with a little bit semi-annual care around posts, with some light staining, and making sure boards are firmly in place. It never ceases to amaze us how much grime can accumulate in and around outdoor living areas. It's not always apparent but once the cleaning begins, there is a wow factor. We'll remove bird droppings, grease from around the barbecue, stains, and even towels if we see them. ​​​Gum and graffiti are gone as well. ​Gutters are hand cleaned and drains are checked for any potential blockage. Eaves, drain pipes and soffits are washed under aggressive pressure using Eco-friendly master cleaning products. It's difficult to imagine, but you won’t believe the difference this can make to your home. ﻿That’s right, we get up there and clean your roof so its free of mildew and other nasty stuff that can create unwanted problems. Actually it isn't really necessary for us to be directly on the roof which saves wear and tear. Are you caring for your roof in order to maintain shingle or tile integrity and appearance? A quick look can identify any damage and algae stains. Our biodegradable cleaners and low pressure rinse system can help you keep the home roofers away. Our safety and training keeps our people safe / insurance costs downl - savings that we pass on to you.